Japanese Episode AG 191: "Decisive Battle! (Satoshi) vs. Regice!!" American Episode 461: "Pace - The Final Frontier!" The battle between Satoshi and Jindai continues! Since Jindai's Samayoru defeated Satoshi's Lizardon, the challenger calls out his Fushigidane to take over. Samayoru manages to confuse Fushigidane, but the grass-type pokemon is able to snap out of it after Satoshi cries out to it. After using a Leech Seed attack, Fushigidane whittles away its opponent's energy until it finally faints. Jindai's second pokemon is Tekkanin. The bug-type pokemon uses a Sand Attack to blind Zenigame, so Satoshi has the pokemon use Hydro Pump on itself to wash the sand away. Before long, Zenigame defeats Tekkanin, forcing Jindai to call on his third pokemon - Solrock. Jindai's pokemon makes quick work of Zenigame, so Satoshi calls his Fushigidane back into battle to take care of it. Solrock's powerful psychic attacks are able to deflect many of Fushigidane's attacks, but the weakened grass-type pokemon still manages to hit its opponent with a Leech Seed. The battle ends with the pokemon knocking each other out, leaving both trainers with only one pokemon apiece. The pokemon to be used in the final battle are revealed to be Pikachu and Regice, the latter having just recently been caught. Pikachu is able to get in a few hits with Iron Tail, but Regice successfully freezes Pikachu and uses Rest to recover its energy. 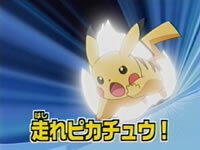 After nearly getting knocked out by Regice's ice attacks, Pikachu launches a powerful Volt Tackle that takes down Jindai's pokemon once and for all. Now that all the Frontier Brain's pokemon are defeated, Satoshi is declared the winner! After receiving the Brave Symbol, Satoshi is declared a winner of the Battle Frontier challenge. Enishida offers him a position as a Frontier Brain, but Satoshi declines, saying he wants to continue traveling the world in search of new pokemon and new rivals. Now that his adventures in the Kanto Battle Frontier are over, what's in store for Satoshi? This episode was great until the train wreck that was the Pikachu vs. Regice battle. I don't think I have to elaborate on that too much; winning by using one Volt Tackle attack after Regice completely healed itself with Rest is cheap no matter how you look at it. I'm also kinda miffed that both Regirock and Registeel eventually won their matches by using Lock On while Regice didn't even try to use the attack. Yeah, you can argue that Regice was just captured and may not have even known how to use the attack yet. But still. The dubbed version continues to have Brandon call Ash by his first name even though Jindai never does that in the Japanese version. Not even once. I think the fact that Jindai always refers to Satoshi as "boy" is a significant character trait, but the dub just sort of glosses over it like it's nothing. Annoying. This episode also marks the last appearance of Brandon for quite a while, so we won't have to put up with his voice actor's dull, uninspired acting for a few more years. Regice and Solrock keep their Japanese voices. Narrator: "Knowing full well this was his last chance to become master of the Battle Frontier, Ash again challenged Brandon. Um...there's nothing in the Japanese version to indicate that this is Satoshi's last chance. Satoshi could try a fourth or fifth or eightieth time if he wanted. Granted, three times is about the limit for the number of times we as an audience would be willing to watch these two battle, but that still doesn't mean that this is his last chance. Today's music edit involves a song that's used way too often as an insert song. Is it Ready Go!? Pokémon Symphonic Medley? Nope! It's Battle Frontier! The song is played from the time Pikachu breaks out of the ice (after it's frozen solid) until Pikachu finishes the Volt Tackle that wins it the battle. In the dub, it's replaced. ThReE sEcOnDs ArE aDdEd To ThE tO bE cOnTiNuEd ScReEn In ThE eNgLiSh VeRsIoN.